Spotify is a freemium service, meaning that basic services are free with advertisements, while additional features, including improved streaming quality and offline music downloads, are offered via paid subscriptions. It is a dream for Spotify Free user to enjoy Spotify music offline. Luckily, there are many Spotify Recorders available in the internet, which will help Spotify free users achieve their dream perfectly. 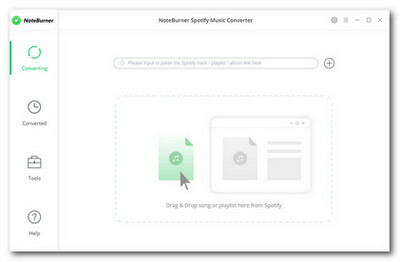 With these tools, downloading or recording Spotify music will be easy enough. However, it is really hard for you to choose from so many Spotify recorder options. You might be scratching your head and cannot decide which one fits your needs well. So below are the top five best Spotify recorders that we pick up from internet. You can choose the best fit from them. 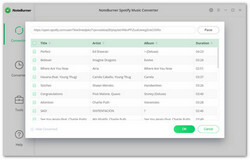 NoteBurner Spotify Music Converter is the highly recommended Spotify Recorder to record music form Spotify, it supports to record or download Spotify music and playlists as MP3, AAC, FLAC and WAV with keeping 100% lossless quality of Spotify music. And no extra hardware or virtual driver needed. 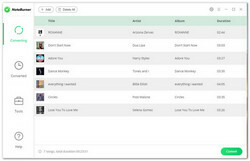 Record Spotify Music as plain MP3, AAC, WAV and FLAC. Record songs at 5X speed with zero quality loss. 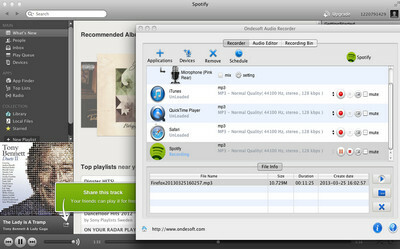 Click button, then you will see a pop-up window which indicates you to copy and paste the playlist link from Spotify. You can copy and paste the link on the link window and click "Add". Then you can click "OK" to finish adding tracks. 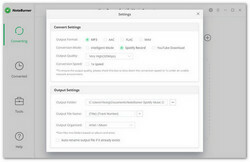 Click the "Convert" button to convert the Spotify music. After conversion, you can click the History button to find the converted files. Then, you can do whatever you want to do with the downloaded Spotify music. 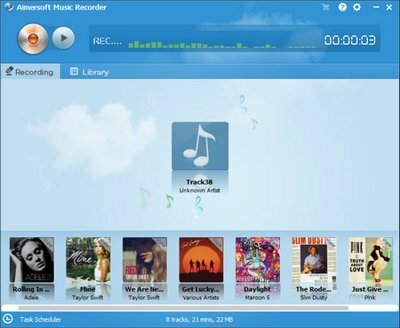 Aimersoft Music Recorder is a smart music and video recorder, not only enables you to record music from Spotify easily but also you can use it to record music from YouTube and some other online radio and video sites such as Pandora, BBC Radio Audio, etc. You can record all fair-sounding songs to high quality M4A/MP3 files from various sources. With only a simple click, you will have all this done without any hassles. Save audio in M4A/MP3 with 100% Original quality. Apowersoft Streaming Audio Recorder is a nice tool which will provide perfect way for recording live streaming audio you hear from radio stations in all around the world. 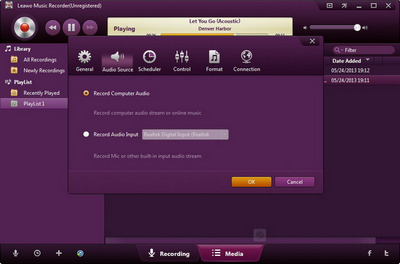 Just search and stream the radio you like, the program supports to record any songs, news, talk shows, etc. and save them to your hard drive. The built-in audio editor of it offers lots of functions including cut, copy, paste, mix and add effects to audio. Ondesoft Audio Recorder is a powerful and easy-to-use Mac audio recording software, with it, you can capture and record audio from any application on Mac (Spotify, Safari, Firefox, Chrome, Apple Music, VLC, QuickTime, FaceTime), record website media like YouTube, Vimeo, Pandora, Lastfm, GrooveShark, and iTunes Radio, grab audio from Mic and CD player. Save recordings to MP3, AAC, FLAC and many more popular formats. Use the editing functions to cut and splice audio clips. The built-in recording scheduler allows you to set start and end times. Record at a wide range of sampling rates. Firstly, run Spotify and Audio Recorder on your Mac. Secondly, add Spotify to the source panel and play the music you plan to record and click on the recorder to start the recording. Finally, when recording is complete, press and the audio file is saved as you set. Click the bottom-left “Audio Source” icon to set audio source you want to record. Two options are provided for you to choose from: Record Computer Audio and Record Audio Input, check the one according to your situation. 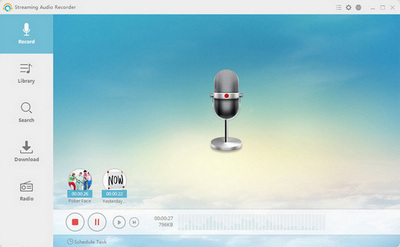 Click the red “Start” button to make Leawo Music Recorder start to record. Five different kinds of Spotify Recorders are listed above. All of these great tools can help you record Spotify music for offline listening. You can download them first for a try, and carefully compare audio capabilities, speed, audio quality, and file format saving options at the very least, then make your choice.